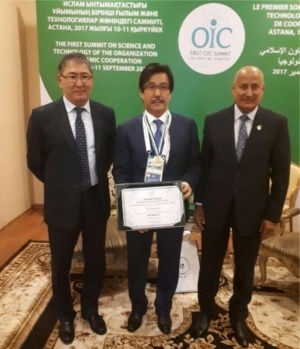 Dr. Abdulaziz Othman Altwaijri awards the ISESCO Prize in Science and Technology to the Rector of Al-Farabi National University, Dr. Mutanov Galimkair Mutanovich, in Astana, Republic of Kazakhstan, in recognition of his pioneering research works and outstanding contributions to scientific research in the Islamic world. The event was attended by the Minister of Education and Science of the Republic of Kazakhstan, Mr. Yerlan Sagadiyev. It is worth noting that the winner of the 2016 edition of ISESCO Science and Technology Prize was announced at the close of the opening session of the Islamic Conference of Ministers of Higher Education and Scientific Research, held by ISESCO in Bamako, Mali, on 14 November 2016, in cooperation with the Malian Ministry of Higher Education and Scientific Research, and in collaboration with the Organization of Islamic Cooperation (OIC), under the high patronage of H.E. Mr. Ibrahim Boubacar Keïta, President of the Republic of Mali. The Al-Farabi Kazakh National University is the leading institution of the system of higher education of the Republic of Kazakhstan. Al-Farabi KazNU was the first laureate in the history of the country of the Presidential award of the Republic of Kazakhstan “For achievements in the area of quality. The University has an enormous educational, scientific, innovative and production potential, which is aimed to the training of specialists of the highest qualification. The Al-Farabi KazNU offers a wide range of specialties, with 14 functioning faculties, 63 departments, 20 scientific research institutes and centers and more than 2000 professors, doctors, scientific candidates and PhD’s.